Sometimes, an unexpected surprise lands in your your letterbox, such as this postcard. Last year, we performed our wedding band music at a relatively small gathering for Nia and Gary. Anyway, the venue is well known as a great place to hold your big day in the East Midlands – let us know if you’d like the hotel details – and the performance room has a great feel from a wedding band perspective. It has a good sized space for a small band to set up in and a dancefloor. After the wedding breakfast the top tables are removed to create a larger dancefloor. From a band acoustic point of view, the roof isn’t too low and there are plenty of alcoves and features in the room that allows the sound to be soaked up, which is a lot better than a bare room with a high roof. 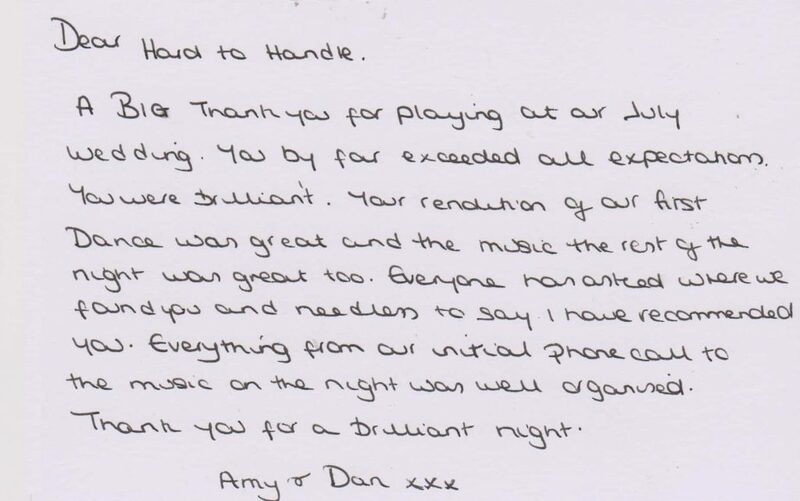 As a wedding band, HARD TO HANDLE aim to get you and your guests on the dance floor and keep you there for the rest of the night, and with up to 85 bookings per year, we like to think that we’re one of the most experienced bands you can hire. But you can tell with some audiences that they are ready to party from the first song, and Nia and Garys’ guests were certainly not shy in showing their appreciation of our music! The first dance we played, “Everlasting love”, was a special request, which went really well, and then we were off into our first 1 hour set. After the DJ-style music segment, we performed the second set, ending with a few tried an tested party tunes (nothing too cheesy) that rounded off the evening really well. 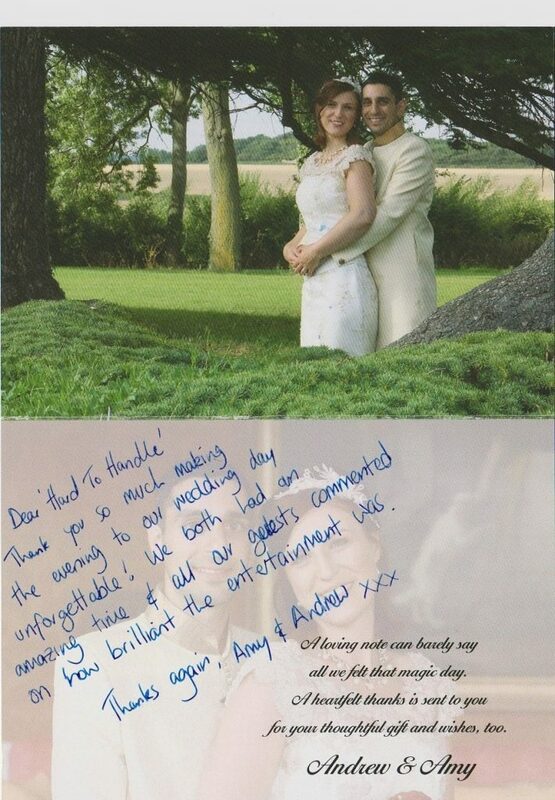 It means a lot to us when brides and grooms take the time to get in touch to tell us what they thought of our performance. So we’ll let the postcard we received (below) talk for itself. 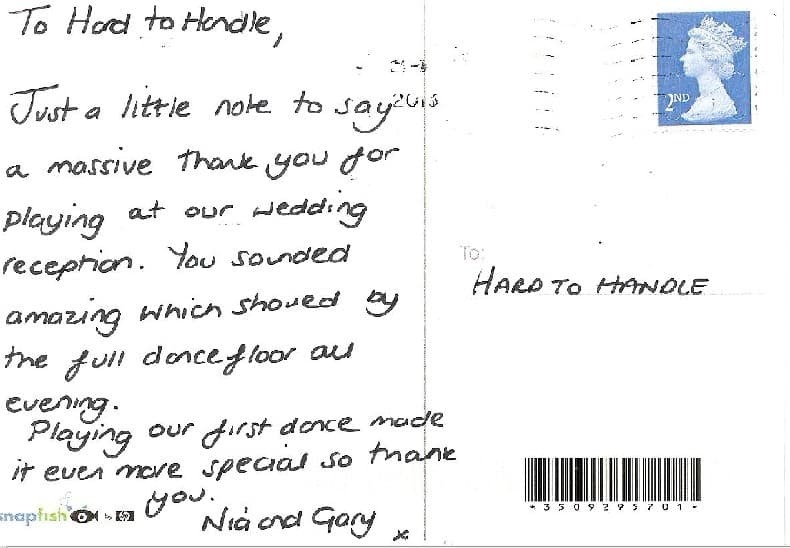 For more information on how to hire HARD TO HANDLE BAND for your wedding reception, please call us on 0796 433 5657. We look forward to hearing from you!